The incomplete check dam at Goudpali village in Naktideul Block of Sambalpur, Orissa, stands testimony to the insensitivity of the laws and the government to the needs of the people. The government has forced work to stop on the check dam being built by people. Goudpali houses around 100 families. It is cradled on a piece of land surrounded by Sankhanala river that runs around it, demarcating the village boundary on three sides. The narrow corridor of land connecting it to the rest of the world is also cut through by the Kusumpur drain. Goudpali also has a substantial reserved forest area adjoining it. Forest produce supplements the livelihood earned from rainfed agriculture. During 1984-85 a team sent by the department of irrigation surveyed the village for building a check dam over river Sankhanala. After a thorough mapping and estimation exercise to gauge the potential of the 'project' the team gave oral assurances to the villagers of building a check dam that would irrigate the fields of Goudpali and the adjoining village, Bramhanipali. The village, waited expectantly, looking forward to an assured harvest. It became a long wait and for years nothing happened beyond the survey. On enquiry, villagers found that the government had found the project too costly at Rs 14-15 lakh to be carried out. Another objection made, the villages found, was that about 1.5 to 2 hectares of reserve forest would be submerged. The next official move came, when in 1997, cajoled and pushed by Ashalata Pradhan, vice president of the zilla parishad enjoined the district collector and other government officials to visit the area again. They too parted after making verbal commitments. Another official survey team paid a visit and conducted a fresh set of surveys. Nothing came off that either. Taking initiative, Pradhan managed to get Rs 50,000 from the zila parishad funds. But the money was sanctioned for building a canal. A canal that had no feeding check dam to take water from! The block level administration gave the contract for the work to one of the villagers, requiring that the canal circumvent any reserve forest area. To make matters worse, the money created friction in the village with some alleging misappropriation. Another group accused the administration of intentionally creating dissension in the village. Exasperated by the insensitivity of the government, in 1999, the village decided to pool their resources and make the check dam on their own. 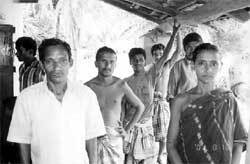 Beginning March 1999, the entire village put in voluntary labour. Each one worked one day every week for four continuous weeks. The village also collected Rs 45,000 for the material to be used. "It was hard earned money", recalls Satyananda Sahu. "We know it was an ambitious plan. The current of water at Kaalo Pahad (the point where the dam was planned) is very high and our plan was to build a 4-4.5 metre high wall of stone. The work was challenging, but we dared to do it because all of us were ready to work together for the village. We thought our action would draw the government into helping us," says Dwiti Krishna Deo, one of the villagers organising work at the check dam. The construction of the check dam was built on a simple yet architecturally perfect idea -- the way most traditional ideas are -- to build the stone wall, support it with a net like structure made up of bamboo so that the flow of the river was not disrupted and then build two spill ways to divert the water to the two sides of the river. The village after building nearly half the structure began to dig a canal of about one kilometre to divert water to fill the 1.22 ha village Kata (large-sized pond with one side open). Around one fourth length of the canal fell inside the Kholagarh reserve forest. No trees were cut, nor there was the need to cut one. The width of the canal was a mere 1-1.2 metres. The water from the check dam, drawn through the canal would have been enough to irrigate more than 300 ha of fields in the village -- a boon for the perennially drought-prone village. As the villagers had hoped for, the government did intervene. But, not as people expected, to help Goudpali. The forest department filed a complaint against 12 villagers for difgging a portion of the canal inside the reserved forest boundary. With the timely help of a known advocate of Deo, they got anticipatory bail. Two and a half years after, the case drags on in the court -- sucking money and life out of the 12 residents of Goudpali, who dared to shape a better future with their own limited resources. Rain has now destroyed the partially completed check dam. "Are we guilty of collective effort?" asks Deo standing at the site of the ruined check dam. "See, we haven't even cut the trees which grow inside our Kata ," says Gokul Behera, a landless resident who also contributed free labour during the work. Ironically, the trench dug, by the forest department, nearly parallel to the, now unused, canal could itself have served the purpose of the canal, reducing the villagers' cost by half. Some forest officials sympathise with the people but claim inability in view of the rules and regulations. The villagers demand to know -- who were these rules formed to help? Any stranger in the village is, today, looked at with some skepticism -- he or she may be carrying another summon from the local courts. Nobody carries a solution to them.